It is late afternoon on Wednesday 12th May 2010 and Nicola phoned Jim and suggested he popped round in the early evening as she was going to open her bottle of Bruichladdich Organic. Jim did not need to be asked twice, 7 o’clock sharp Jim was sitting at Nicola’s tasting table for a taste of Single Malt from one of the Whisky Boys favourite Distilleries. From our website you will see that Jim has on many occasions visited Islay, and Bruichladdich Distillery is always top of his list for a visit, take a minute and visit or gallery section and you can see many photo’s of Islay and it’s Distilleries and some taken with Jim McEwan, Bruichladdich’s Director of Production. So lets get the cork out of this bottle and have a dram or two. Nose…Orchard fruits, especially apples, giving off a strong aroma of ale. Taste…Smooth and tasty, amazing for a 6 year old, Bruichladdich and Jim McEwan does it again, orchard fruits galore, a very special dram. Nose…A very pleasant sweet and creamy citrus nose, with no harshness, a hint of lazy smoke. Taste…Smooth and mellow some wood and barley but the sweetness and cream are still present. Only a gesture of water needed, if any. Finish…Medium to long a new classic from Bruichladdich leaving a delicious tingle. Well, that must be one of the most pleasant tastings in a while, a classic dram from a classic distillery for the classic Isle of Islay, each of Bruichladdich’s expressions just get better and better, canny wait until the next one. A special thanks to Jim McEwan for recommending this fine bottle of Whisky. This was purchased by Jacqueline and myself during our visit to Islay earlier this year (Jim’s Islay break). 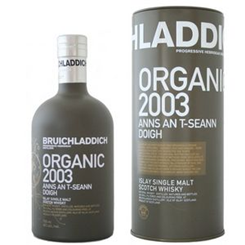 We were looking to buy Nicola a bottle for her **birthday and whilst discussing with Jim that Nicola did not like the peaty taste of many Islay Malts, Jim was quick to ensure us this would not dissappoint her – a 4 cork rating only confirms this !!! Nicola found this malt to be her new best favourite Islay, and I can’t blame her. 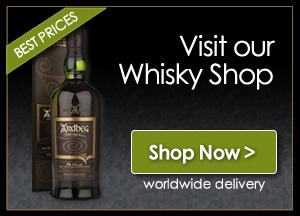 Check out the distilleries website and get out there and buy a bottle or two, although some special expressions may only be available at the distillery or online and in some specialist Whisky shops. As always tell them the Whisky Boys sent you.